Save Money. Save Time. Guarantee Your Spot Online. Government Center Garage offers a variety of online permits, allowing customers to guarantee their parking space, save money, and take the stress out of parking. NEW! $20 Early Bird Online Rate Available. Rate available with online purchase only. Enter between 5:00am - 9:30am. Exit before 8:30pm. Stop driving around looking for parking during the busy work week. 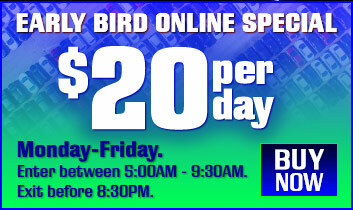 Daily Parking guarantees your parking space Monday - Friday. Enter any time after 5 a.m. and exit before 5 a.m. the following day. Driving into Boston on Friday? Enter any time after 5 a.m. and exit before 8:30 p.m. Rate valid with online purchase only. Staying in town? Going away? Buy Park 'N Stay for $15 per day. Store your car for 3 -30 days for $15 per day. No in and out privileges during car storage. Rate valid only with online purchase only. Permit must be purchased prior to entering the garage. When entering the garage: pull a ticket at the entrance gate. Park your vehicle in any open space that's not labeled Reserved or Handicapped. When exiting the garage: drive to the exit gate, scan parking ticket, then scan the barcode located on the printed parking permit. Parking permits are only valid to park for the hours indicated on the permit. Staying for additional hours/days will result in additional charges.